CARRUM Downs police are “hoping to speak” to a man who was caught driving with a cancelled registration plate. 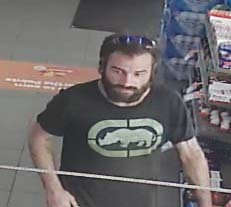 The man pulled into a service station on Frankston-Dandenong Road at around 10.45am on 27 March in a white Holden Commodore, registration OUG134. Police allege they approached the man, but he ran back to his car and accelerated heavily, causing the car to “fishtail” and narrowly miss police members.